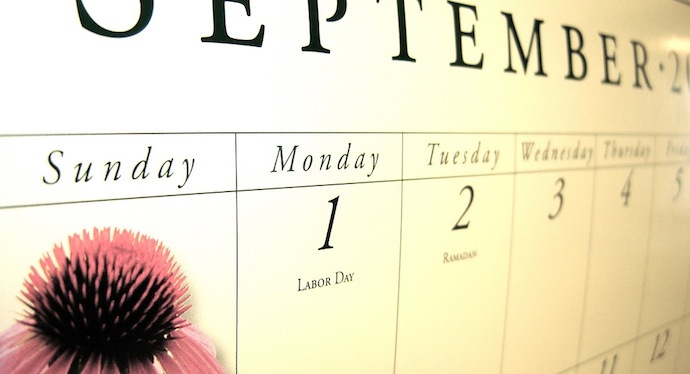 Things You Need to Do for Your Home in September! September. The month where summer ends and fall begins…unless you live in San Diego. Then it’s just summer all year. But for most of us as the seasons change so do the things we need to do around our house. While you may think that it’s a bit early to be considering the coming autumn temperatures, September is actually the perfect month to get a lot of home related items in order as you prepare for a coming change in temperature. 1. Get your chimney and furnace inspected. This is key for homes that need their heat running efficiently in the winter months. Getting your furnace and chimney checked in September gives you time to have any issues fixed in enough time before the weather turns. I actually learned this lesson personally. I have a chimney, but I don’t have a fireplace so why would I need my chimney inspected? A random chimney company was in the area and gave me a discount to have my chimney inspected and it was a good thing they did. I had damage at the top of my chimney and it hadn’t been cleaned in years which was costing me money as my furnace was having to work twice as hard to heat my home. Take it from me. Get your chimney inspected and cleaned as well as your furnace. Your home (and wallet) will thank you come winter. 2. Plan a weekend to take care of the outdoor furniture. Whether you have a deck, a patio or just some stuff in the yard, plan out a weekend where you’ll officially put everything away. If you don’t plan on it, you’ll find it’s Thanksgiving and you still have a picnic table in your backyard. 3. Swap out those screen windows for storm windows. It’s easy just to leave the screen windows up and just forget about it. But if you have storm windows, your home will stay warmer and heat more efficiently with that extra layer of protection from storm windows. Also if you’re in an area that gets snow, you need those storm windows to prevent that winter precipitation from getting inside your window sills and causing rot. It’s a pain in the neck, but worth it in the long run. 4. Check your windows and doors for drafts. You probably should have done this before summer began, but if you forgot now’s the time to do a check of all your windows and doors to see if there’s air escaping. You’ll want to seal these up before you burn your money away with heat escaping your home. They can be simple to fix in some instances by just adding some weatherstripping around them. If you’ve got a door that leads maybe to an uninsulated room like a garage or mud room that has a draft underneath it, I highly recommend the Twin Draft Guard. Possibly the best $10 I’ve spent at Target. 5. Head over to YankeeCandle.com and order a pumpkin spice candle. This is a requirement for all homes once October begins. And there you have it. A few simple things to get your home ready for the cooler months ahead. Now that you’re done, you can head on over to Starbucks for an early fall treat as they have their Pumpkin Spice Latte available early this year to celebrate its 10th anniversary. For those looking for more to do around the house, head on over to Houzz who has a pretty exhaustive checklist for your home in September. This entry was posted in Home improvement, Real Estate and tagged agents in wenatchee wa, Business, Chimney, coldwell banker lavigne, coldwell banker wenatchee, Construction and Maintenance, families in wenatchee, Furnace, home maintenance, homes for sale in wenatchee, Materials and Supplies, preparing for winter, quincy real estate, Storm window, Wenatchee real estate, winterizer your home. Bookmark the permalink.